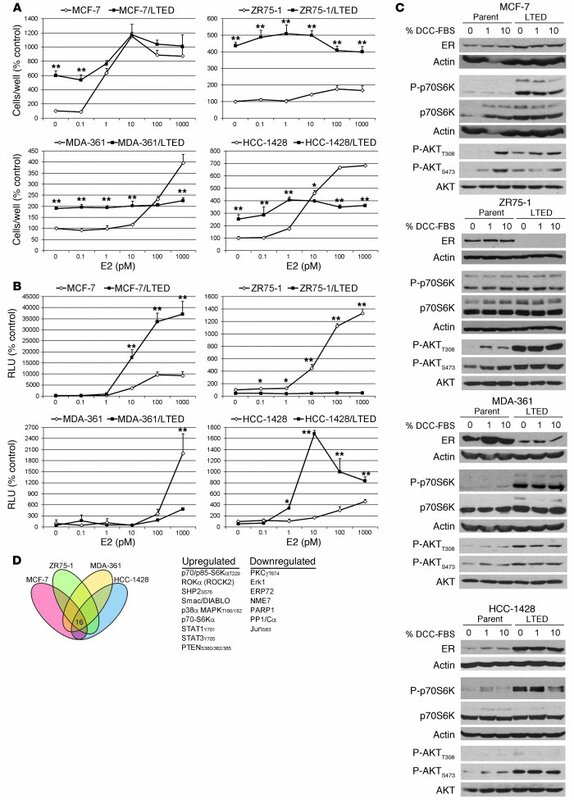 LTED cells exhibit PI3K/mTOR pathway hyperactivation and variable response to E2. (A) Cells were treated with 10% DCC-FBS with or without 0–1,000 pM E2. Media and drugs were replenished every 2–3 days. Adherent cells were counted after 5–10 days. (B) Cells transfected with luciferase reporter plasmids were treated as in A. Luciferase activities were measured after 16–20 hours. Data are presented as percent parental control (RLU, firefly/Renilla), mean of triplicates ± SD, and were analyzed using 2-way ANOVA. *P < 0.05, **P < 0.01 versus parental cells, Bonferroni post-hoc test corrected for multiple comparisons. (C) Lysates from cells treated with 0%–10% DCC-FBS for 24 hours were analyzed by immunoblotting with the indicated antibodies. (D) Lysates from cells treated with 1% DCC-FBS for 24 hours were analyzed using antibody microarrays. Proteins/phosphoproteins altered at least 1.4-fold in LTED/parental comparisons were compared for overlap, which revealed 16 proteins/phosphoproteins commonly altered across all LTED lines.